Where can you go for the best barracuda fishing? Thousands of fishermen head to Key West to try their luck at a number of different types of fishing. 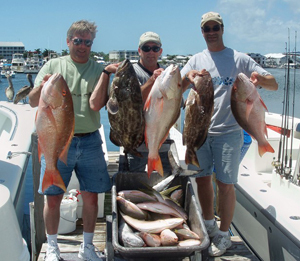 Only in Key West can you fish on the flats, head over to the reefs, and then adventure into the open ocean, all within miles of each location. Even legendary hunting and fishing enthusiast (and award-winning novelist) Ernest Hemingway knew that if you want to go on a true adventure, and catch the biggest fish, you need to head to Key West. And that’s exactly what Tony, from Asheville, N.C., did recently. Chosen as our Catch of the Week, Tony nabbed an amazing barracuda from a recent deep sea excursion on our Key West fishing charter. With the help of the boat’s captain, Tony and his father found an ideal location for luring the barracuda, and although it put up quite a struggle, it was no match for these experienced anglers. If you want to experience some unforgettable deep sea fishing, reserve a spot with our experienced captains on a Key West fishing charter and you might bring home a big one just like Tony! 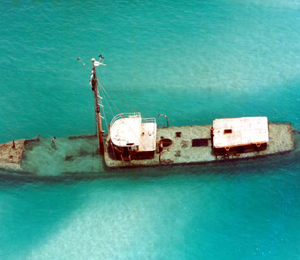 The best place to catch Barracuda in Key West is in the backcountry and deep sea, and they can be found in Key West year round. 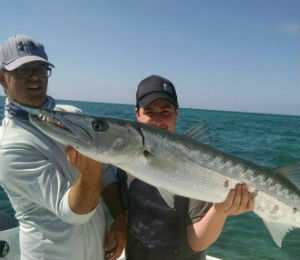 The Key West backcountry provides the barracuda with great cover within the mangroves, and the area is also rich in smaller fish which the barracuda can easily hunt. They also head into the flats for some easy hunting, so it’s possible to catch a barracuda with light tackle here. And because they are so numerous, and don’t spook easily, even novice fishermen can reel in a ‘cuda. You’ll find barracudas on the flats most often during the winter months, so if you want to avoid the springtime rush of tourists and fishing tournaments, head to Key West during the winter lull. Barracudas don’t stick solely to the coral reefs and seagrasses, and they can often be found lurking in the deep with some of the other sought-after giants, like marlin, wahoo and sailfish. 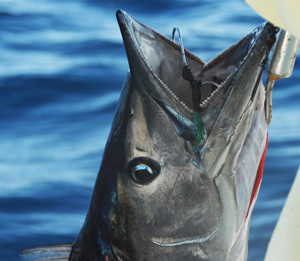 Catching a barracuda on a Key West fishing charter isn’t always easy in the open waters. These fish are aggressive and unpredictable, and they often breach to get away. They are also rather intimidating to look at with their menacing, and toothy, smiles. Most fishermen prefer big tackle and big boats to reel in these feisty fish, as they are most often found in the deeper waters, and due to the size of the barracuda, they can put up quite a fight. They are an aggressive fish, known for using surprise attacks on their prey. Barracudas can also swim more than 25 miles per hour, which means you have to act fast to prove you’re worthy of the catch. They can grow up to 5.5 feet long and weigh more than 100 pounds.